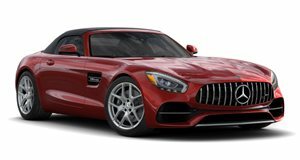 The tuning kit for the Mercedes-Benz SLS AMG Roadster showcased at Geneva by the Swiss tuner is dubbed the FAB Design Jetstream Roadster and remains a firm favorite with the Geneva Motor Show faithful. Essentially, the Jetstream is the convertible version of the light-blue Gulfstream which was unveiled in Geneva last year, and it&apos;s looking flaming-hot in a shade of matte red. It&apos;s hardtop sibling was also recently spied in matte orange roaming the streets of London. The wide-body aero kit is made up of a front bumper with vertically positioned daytime running lights, and widened fenders that flow into the side skirts and up into the widened quarter panels. At the rear, a bumper comes with bigger vents and a diffuser supporting carbon-fiber lip spoiler. FAB Design also developed a stainless-steel sports exhaust system with integrated valve control and four classic round pipes. Power has increased from 563 to 607hp and 479 to 509lb-ft of torque, enabling the SLS Jetstream to sprint from 0-62mph in 3.6 seconds and hit a top speed of 202mph, 5mph more than the standard supercar.